But yeah, it should be Info instead of talk. This probably isn't final though. And I'm assuming the Game opening logo is already done also? Bonus looks good, and I am impressed :D Does the presence of the Star Potion mean the downloadable items/chapters will be open to users who use the patch? ^Not exactly, no. We may implement that in the future though, in the main patch or a separate patch. We know that people want the special features that they can't get without an actual DS so we'll try and accommodate everyone regarding those matters. @someonewhodied we haven't done any graphic editing yet. I'm still looking into such things. Will wait for full patch. You guys are heroes for doing this. what exactly does the bonus feature do? 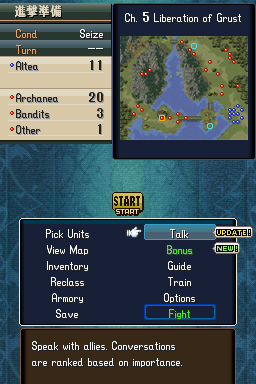 It gives stat-bonuses to units IIRC. I forget the specifics though since it's been a while since I've played the game. It's time-based, meaning you can only get a bonus after a certain amount of time. I'm guessing you can change the time on the DS though to play around with that. Someone else feel free to elaborate. Oh and thanks for the comments everyone. 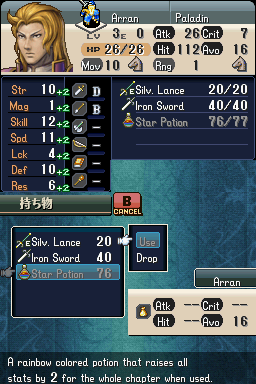 It will also sometimes give you items or weapons to use along with support bonuses, I believe. 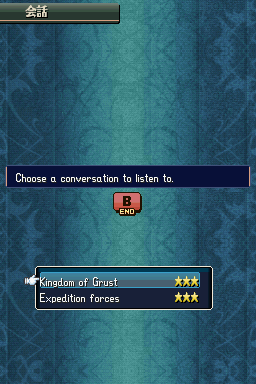 I'm hesistant to use the term "support" since people will get confused with FE6-10's support conversations. I'd propose just going with "Conditions," since the Japanese does translate to "Everyone's Conditions." Conditioning, maybe? Like how in sports you do conditioning to increase your athletic ability (which in FE equates to stat-ups)? Since it's essentially a "go off and do your own thing and find stuff" from a "story" standpoint, Conditions could also work if they fit. Also something like "Findings" or a similar word may also work. How about traits? though not sure if that's really the right word for it. or mabey timer or something since the feature is time related. I think you should actually keep calling it bonus. I cant see anything wrong with that. "Condition" I think is best. Not Conditions. Condition. As a verb, it could be like workout conditioning, which is what you'll be doing, and as a noun it could refer to the condition of the characters. smaller word and less txt to add or format.